My name is Rawa, I’m from Eritrea. I feel lucky to be in the UK. But it’s also hard because I’m still waiting for my asylum decision from the Home Office. I started learning to cook when I was 7 years old – in my culture they believe it’s important for women to learn to cook from a young age. I have a real passion for cooking and presenting things nicely and getting the perfect taste. 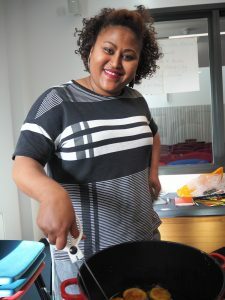 I joined Migrateful because it is a really nice opportunity for me to share my traditional food with the community. Eritrean cuisine is a fusion of Eritrea’s native culinary traditions and social interchanges with other regions in Africa and the Middle East. It shares similarities with the cuisines from other countries in the horn of Africa, especially Ethiopia.